Practical Joke has played a significant role in boosting Into Mischief’s fee to the extent that in 2019 he will stand for $150,000, even though the Spendthift sire was available for as little as $7,500 in 2012. 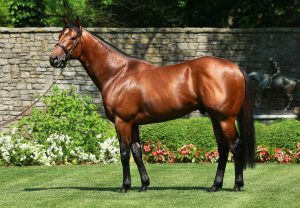 Practical Joke became his sire’s second Gr.1 winner, following the dual Breeders’ Cup Dirt Mile winner Goldencents, when he landed the Hopeful Stakes over seven furlongs. Practical Joke added the Gr.1 Champagne Stakes a month later before finishing third in the Breeders’ Cup Juvenile. His efforts earned him 122 on the Experimental Free Handicap. He also proved very hard to beat around one turn as a three-year-old, taking the Gr.3 Dwyer Stakes and then the Gr.1 H. Allen Jerkens Stakes, in which he gave weight and a beating to the future Gr.1 Vosburgh Stakes winner Takaful. Much of Into Mischief’s success has been with the MR PROSPECTOR line. Practical Joke and Goldencents are both out of grand-daughters of FORTY NINER, and he has black-type winners out of daughters of ROAR and TRIPPI. 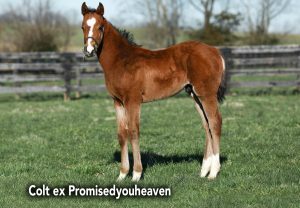 As MR PROSPECTOR will be back in the fifth generation of Practical Joke’s foals, there is ample scope to add extra lines. Into Mischief also has two black-type winners out of CARSON CITY mares and a Gr.3 winner out of a mare by Carson City’s son FIVE STAR DAY, which suggests CITY ZIP mares. Others are out of mares by GONE WEST’s sons SPEIGHTSTOWN (2 Graded winners), GRAND SLAM and PROUD CITIZEN, so mares by SPEIGHTSTOWN look ideal for Practical Joke. They create 5x4 to both STORM CAT and MR PROSPECTOR. Mares by MR GREELEY and ELUSIVE QUALITY should also be useful means of reinforcing Practical Joke’s speed. Other MR PROSPECTOR line stallions which appear among the broodmare sires of Into Mischief’s Graded winners are LEMON DROP KID, LINE INTHE SAND and VICTORY GALLOP. VICTORY GALLOP, the broodmare sire of Gr.2 winner Conquest Enforcer, represents the FAPPIANO branch. Practical Joke’s grandsire Harlan’s Holiday enjoyed plenty of success with the FAPPIANO branch, siring Graded winners from daughters of UNBRIDLED (2), UNBRIDLED’S SONG (2), EMPIRE MAKER, RED BULLET and VICTORY GALLOP. This suggests that mares by BROKEN VOW, PIONEEROF THE NILE and BODEMEISTER are well worth trying. 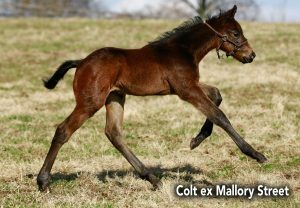 Into Mischief sired Listed winner Holiday Mischief from a mare by MARIA’S MON. Maria’s Mon’s sire WAVERING MONARCH was the broodmare sire of Harlan’s Holiday’s very fast son Majesticperfection. SEATTLE SLEW line mares supplied Harlan’s Holiday with several Graded stakes performers, with Graded winners out of daughters of DONERAILE COURT, SLEW CITY SLEW and PULPIT. There is also a Gr.2 performer out of a TAPIT mare, which suggests that Practical Joke could work well with the A.P.INDY branch. Into Mischief’s Gr.2 winner Vyjack is out of a mare by STRAVINSKY, by NUREYEV, while his Gr.3 winner Can The Man is out of a DANZIG mare. Harlan’s Holiday also had a Gr.3 winner out of mare by a grandson of DANZIG, which raises the options of mares by such as WAR FRONT, WAR CHANT, BELONG TO ME, BOUNDARY, EXCHANGE RATE and HONOR GRADES. All of these could reinforce Practical Joke’s speed. Grand-daughters of Danzig create 5 x 3 to him with Practical Joke. Practical Joke is a member of the STORM CAT male line, but this multiple champion 2yo sire will be back in the fifth generation of Practical Joke’s foals. Again this allows mares with STORM CAT blood. Harlan’s Holiday sired Graded stakes winners from mares by DYNAFORMER and SILVER HAWK, plus a Gr.2 winner out of a mare by KRIS S.’s son ARCH.